Click to download the invite. Invite friends and family to come to your home for a party where you'll exchange cookie recipes and nibble on everyone's sweet creations while mixing and mingling. The invitation you send sets the expectations for the party, so be sure you include all the extra special details your guests will need to know. Each printable swap invitation will download and print using Adobe. Personalize the invitations with your party details before printing. 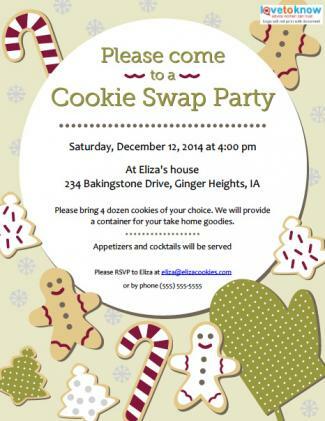 You can host a swap anytime and use the invitation above, or use one of the following appropriate for a Christmas cookie exchange party. 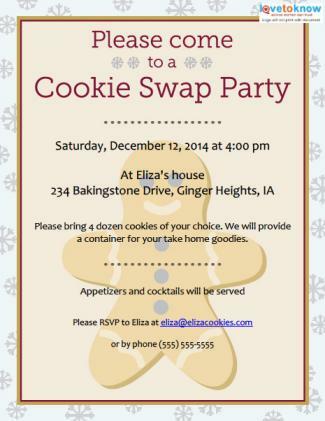 One lone gingerbread man sits in the center background of this cookie swap party invitation. Snowflakes dance around the border of the invitation. The personalized party details print over the top of the gingerbread man cookie. Click to download the gingerbread man invite. The holiday cookie swap invitation features the symbols of the holidays - including cookies! Candy canes, gingerbread men cookies, snowflakes, and oven mitts dance around this festive invitation. A round circle, representative of a cookie, sits center stage, so you can fill in your party details. Click to download the Christmas invite. Tell guests to bring containers to carry home the goodies they receive from the party. If you decide to provide cellophane bags, treat bags, or containers for them to take cookies home, let them know this instead. Tell guests how many cookies they should bring, like two or four dozen, depending on how many guests are expected to attend. Ask guests to bring printed copies of their recipe so they can swap it with others at the party. Include how many copies to bring as well. 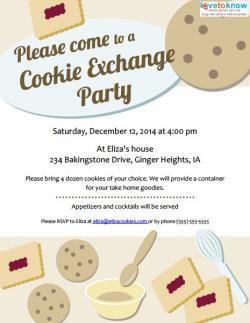 The invitation for a cookie exchange party provides guests with all the information they need to have a great night. They can share their favorite recipe and baked goods with the other guests and take home a bunch of goodies and recipes in the process.